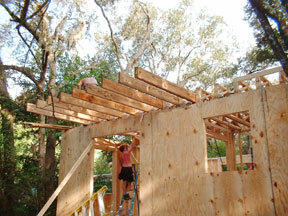 Well, our early start was somewhat wasted by some issues with the placement of one or two of the interior walls. It was a simple and genuine error by our framers but it cost almost the entire morning to fix. However, within an hour of starting on the floor trusses, they had six set in place, on and between the ground floor walls. They were easily handed up to two guys on step ladders at the walls. Our framers were delighted to find that taking the time to make sure the walls were set accurately paid off as the floor trusses were dropping into place for nailing-in without any problems. 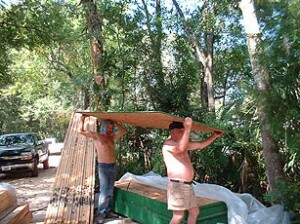 Here’s John and Frank (a delightful man in his 70s) bringing a fresh floor joist for Hollywood to set. In the background are the pipes that will serve the kitchen (where these joists are being fitted), the small powder room behind, and the second story. 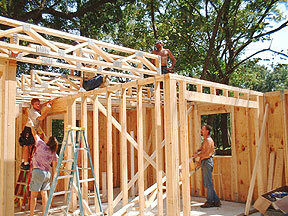 Check out the general contractor/owner – ie: me – asking questions about how the floor trusses are set. 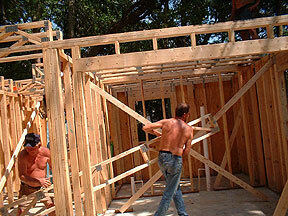 The framers were happy to have me around and were patient with my comments and questions. 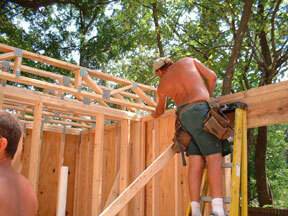 Several times I pointed out potential problems that aided the progress of the job. I picked my framers carefully with this kind of thing in mind as I wanted to be involved but not “in the way”. I kept to a self-imposed guideline to keep in the opposite corner to whatever’s going on yet maintain a clear view. If I didn’t understand what was going on, I asked. We have all got on really well. It’s 1:30PM and more than half the floor trusses are set, including the special, triple-laminated, load-bearing boards, seen here with Jim underneath them and “Hollywood” on the wall. These allow us to have the living room extend into the dining room without any kind of wall between them and still have a second story. 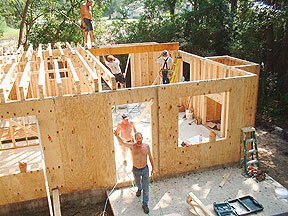 This wide shot shows a relaxed and happy crew, more at at ease with their progress, now. Just before the floor truss layout was complete, the second story flooring was carried to the house, one section at a time, by Frank and John, using a novel method. They were stored in the ground floor of the house to be ready for laying. The boards are 3/4″ tongue-and-groove OSB that is impregnated with a special wax to waterproof it. Hollywood says he’s seen this stuff lie underwater for six months without warping. Among the last floor trusses to go in this day had 16′ 2x8s nailed to them to provide catilevered (twice as much nailed to the trusses as sticks out) floor support for the second floor balcony. Here’s Pat holding a 2×8 in place for Hollywood to nail in place with his nail-gun. Once these were set, we had to adjourn a short day for progress.